Who? What? Where? Why? When? Promoting your startup can often be a challenge. Am I asking the right questions? Am I pitching a well written elevator speech? Are people grasping the concept and are they interested in what I am saying? How do you ensure that the audience is really listening? 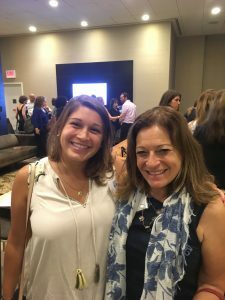 Networking can be an intimidating social event for many people, I know it is for me and it is sometimes difficult for us to put ourselves out there. In an attempt to market our self and learn more Jill and I went to an event in NYC, called Women in Tech. I wasn’t sure what to expect from this event. I ended up taking away not just helpful business and life skills, but incredible respect and compassion for these women and what they are trying to accomplish to help others. I felt at ease in this type of environment. People were genuine and wanted to see others succeed. The first half of the event consisted of some schmoozing with some yummy food! The second half of the event was filled with three speakers, Ilaina Edison, Efrat Roman, and Rebecca Fuhrman. Ilaina Edison was promoting her startup, Extend Fertility, giving women the opportunity to freeze their eggs in a supportive atmosphere (http://www.extendfertility.com/). Rebecca Fuhrman was speaking on Tikkun Olam Makers behalf, which creates affordable solutions for everyday obstacles for people facing disabilities (http://www.tomglobal.org/). My favorite speaker was Efrat Roman, CEO and founder of http://www.curediva.com/, who had also invented the EZbra for women being diagnosed with breast cancer. The way she presented her product was flawless. She had an incredible story as a breast cancer survivor that eventually lead up to the release of EZbra. Efrat had no props except for her demo and her audience was completely captivated. My biggest take away from this event is how are you painting the picture of your product or service? How are you making the audience feel? Because if you make them feel something, then you have their ultimate attention.